The Himalaya Mountains were formed during the Tertiary continent-continent collision between India and Asia and contain the tallest mountains, as well as those exhibiting the greatest vertical relief over short distances, in the world. The range extends for more than 1,800 miles (3,000 km) from the Kara-koram near Kabul, Afghanistan, past Lhasa, Tibet, to Arunachal Pradesh in the remote Assam Province of India. Ten of the world's 14 peaks that rise to more than 26,000 feet (8,000 m) are located in the Himalayas, including Mount Everest, 29,035 feet (8,850 m), Nanga Parbat, 26,650 feet (8,123 m), and Namche Barwa, 25,440 feet (7,754 m). The rivers that drain the Himalayas exhibit some of the highest sediment outputs in the world, including the Indus, Ganges, and Brahmaputra. 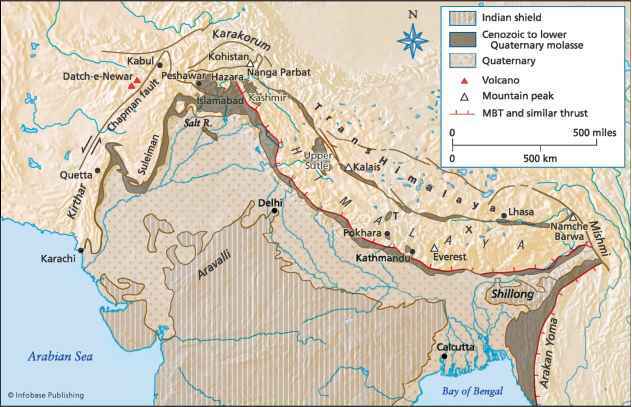 The Indo-Gangetic Plain, on the southern side of the Himalayas, is a foreland basin filled by sediments eroded from the mountains and deposited on Precambrian and Gondwanan rocks of peninsular India. The northern margin of the Himalayas is marked by the world's highest and largest uplifted plateau, the Tibetan Plateau. Simplified map of the Himalaya Mountains and surrounding areas, showing main tectonic zones and faults and Cenozoic-Quaternary basins. The Indus-Tsangpo suture is located along the boundary between the Transhimalaya and the Himalayas. Names are as follows: Ch F, Chaman faults; DeN, Dacht-e-Newar; E, Everest (29,015 feet [8,846 m]); H, Hazara; I, Islamabad; K, Kathmandu; Ka, Kashmir; Kb, Kabul; Ki, Karachi; Ko, Kohistan; Ks, Kailas; NB, Namche Barwa; NP, Nanga Parbat (26,650 feet or 8,125 m); P, Peshawar; Pk, Pokhra; Q, Quetta; T, Thakkhola; US, Upper Sutlej. basement of the High Himalaya. Finally, the Indus-Tsangpo suture is the suture between the Himalayas and the Tibetan Plateau to the north. Sedimentary rocks in the Himalayas record events on the Indian subcontinent, including a thick Cam-brian-Ordovician through Late Carboniferous/Early Permian Gondwanan sequence, followed by rocks deposited during rifting and subsidence events on the margins of the Tethys and Neotethys Oceans. 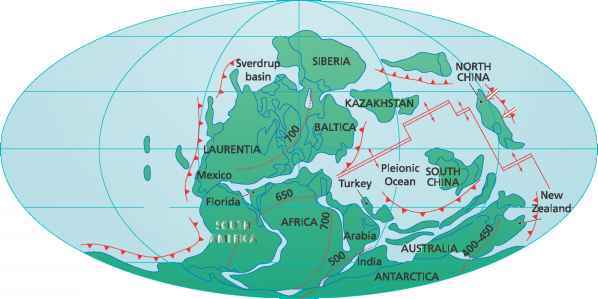 The collision of India with Asia was in progress by the Early Eocene. This collision exposed the diverse rocks in the Himalayas, revealing a rich geologic history that extends back to the Precambrian, where shield rocks of the Aravalli and Delhi cratons are intruded by 500-million-year-old granites. subduction of Tethyan oceanic crust along the southern margin of Tibet formed an Andean-style arc represented by the Trans-Himalaya batholith that extends west into the Kohistan island arc sequence. The obduction of ophiolites and high-pressure (blueschist facies) metamorphism dated to have occurred around 100 million years ago is believed to be related to this subduction. Thrust stacks began stacking up on the Indian subcontinent, and by the Miocene attempted deep intracrustal subduction of the Indian plate beneath Tibet along the Main Central Thrust formed high-grade metamorphism and generated a suite of granitic rocks in the Himalayas. After 15-10 million years ago movements were transferred to the south to the Main Frontal Thrust, which is still active. What type of plate boundary is the himalayan mountains?